Doing the Same Thing Over – Expecting Different Results! Well, here it is 13 July 2014………..The time flies when one is having so much fun. The weather is definitely Summer Time in the South! We reached 99 degrees and 50% humidity yesterday – Lovely. This is a good time to stay indoors and work on quilt projects – just like the Cold Winters in the North! 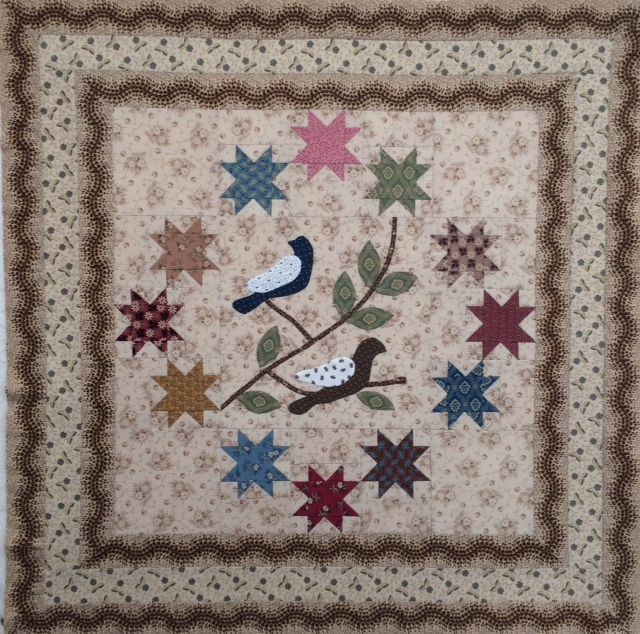 If you follow my Blog you know that I had been working on a Quilt called Enduring Love #270 using Judi Rothermel fabrics from Old Sturbridge Collection called Enduring Legacy. Being a Type A Perfectionist and OK – Compulsive Obsessive Quilter, this project was doomed from the beginning – I just did not realize it! After working on it on and off since late April, stopping at one point and redoing the entire quilt, I arrived at the border of 6″ Stars. I will not bore all with my lovely trip through the vicissitudes of the life of a perfectionist quilter, so here is the bottom line. Because I am chemically sensitive, all fabric is washed before bring it to the Studio. I NEVER once thought that by washing this fabric some of the dyed pieces would have faded and that the fabric would have stretching issues. Now on to more positive things. 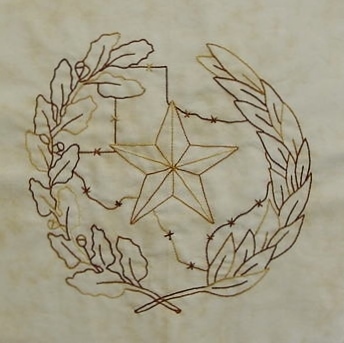 I have completed my Stars Across Texas embroidery project – I have decided to wait awhile before I design a setting. There is something to say about hand work and that is, “one can control the outcome”! Last year I became interested in Reproduction fabric and Australian quilts. 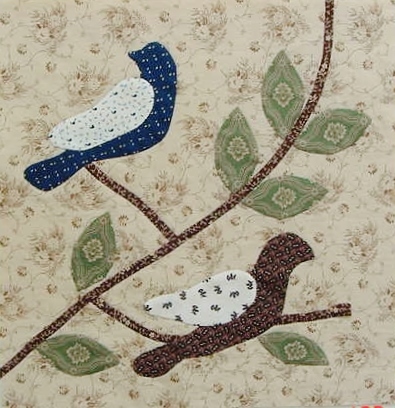 The Australian quilters love English Paper Piecing (EPP) and their quilts really pop and look great. There is a lot of intense hand work in their patterns and sooooo challenging! I cancelled all of my US magazines and only subscribe to Quiltmania. LuAnn of luannsloosethreads.blogspot.com blogged about a quilt that she was starting that is in Quiltmania Magazine Number 107. Be sure to go to her Blog – she does some great work. 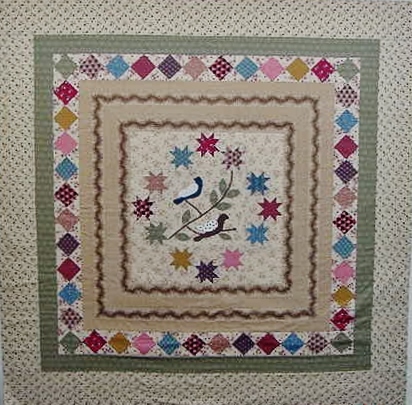 Here is a picture of the quilt called Brinton Hall by Leigh Latimore (http://leighquilts.blogspot.com) Check out her Blog also. I immediately knew that this would be my next project. So off to the Stash to pull fabrics. I am working on the Center Medallion now doing the EPP rings around a “fussy” cut Center. I have missed working with my batiks this last year so I will be using them in this quilt. Hopefully it will not be a disaster. LuAnn also blogged about a book that is absolutely great when developing an in-depth understanding of EPP. 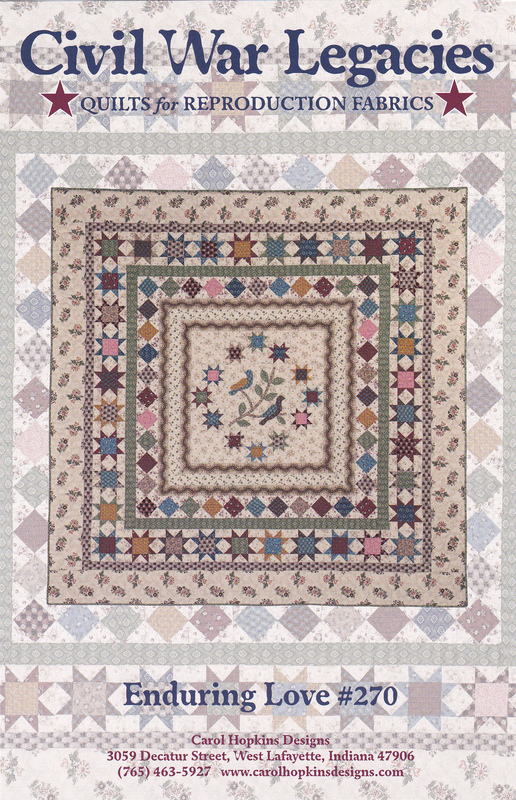 The book is called “all points patchwork” – English Paper Piecing Beyond the Hexagon for Quilts and Small Projects by Diane Gilleland. Amazon has it on their website for about $12.00. There are 220 pages of illustrations of “the many ways to use EPP as possible”. (a direct quote from her Idea Book versus Project Book). It is a great book! I love the Blogging world – quilters share so many ideas and projects and they are all inspiring. So with that, I am now going to go and work on EPP Hexagons. I have covered up the sewing machine for at least 2 weeks and will be sitting here working on EPP watching some movies and resting my weary mind from the last quilt project that I want to forget. Doesn’t this look inviting? 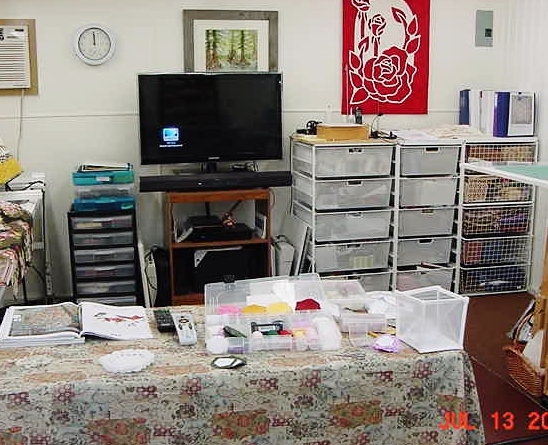 My EPP Sewing Table and a TV – What more do I want? Have a wonderful week, enjoy life, and always take time to take in some Sun (good Vitamin D). Greetings from the State of Texas where our 5 year plus Drought is OVER! We are officially drought free. This is the way it goes here in South Texas and what a relief that we are in El Nino weather pattern. Our grass is growing back and our 95 pine trees are looking so pretty. I feel for the families who have lost loved ones and their homes. Mother Nature can provide blessings, but at the same time heartache. The last time I posted I believe I was working on a quilt by Carol Hopkins Designs. 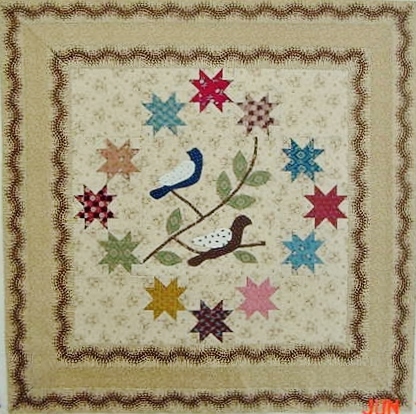 The pattern is from Civil War Legacies – Quilts for Reproduction Fabrics. 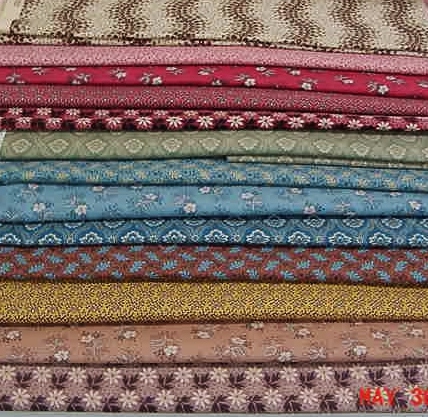 I keep calling my quilt Enduring Legacy – well….. DUH that is the fabric line by Judi Rothermel. This pattern is Enduring Love #270. I love the quilt and the fabric line and it was coming together so pretty. I knew that when putting the Medallion together that a few of the star points were “cut off”, but decided that this would be a “utility” quilt and not one to show. 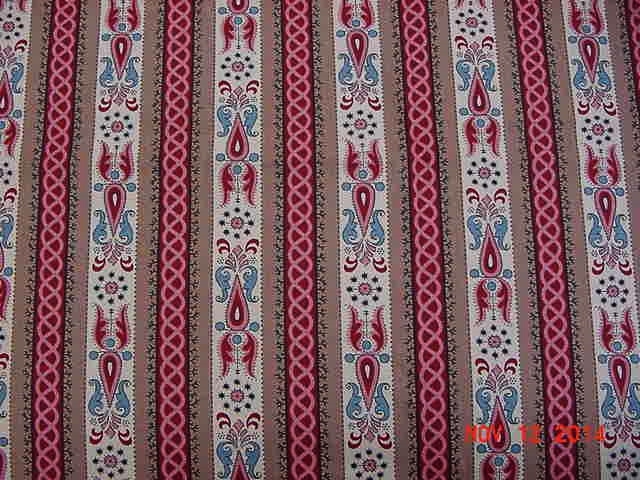 The pattern calls for 8 borders. The Medallion has a serpentine 2″ border strip mitered, a 2″ border not mitered, and then another 2″ serpentine border mitered! So in my stressed stupor from the last 15 months, I followed the pattern. Moving right along I finished the first 3 borders and attempted to start the 40 stars for the next border. Here is a picture of my progress about 3 weeks ago. I was fairly pleased with myself for getting this much done even after Clay’s neck surgery in April! Absolutely Beautiful – Looking Perfect? The next border consisted of 40 Squares in a Square Block. I was very careful to measure and make sure that each 4 1/2″ block would be perfect and not have issues like I did with a few of the star points! Quilting right along, Ms Perfectionist put the entire border on ONLY to find out that I was off 3/8 of an inch when I put the top border on! LOVELY! I kept telling myself and hubby, oh well, this will not be a quilt for Show….. After ripping the entire border off, redoing the side borders and thinking, ahhhh now it should be OK (yes I checked to see if all corners were squared) I still had a problem. I decided to walk away and “think about it”. But I do believe that this one put me over the edge (Type A’s have this problem – LOL). Sunday morning I made up my mind that I would take the quilt apart to find my mistakes. Boy did I find some, and the worst was in the very first Serpentine border. 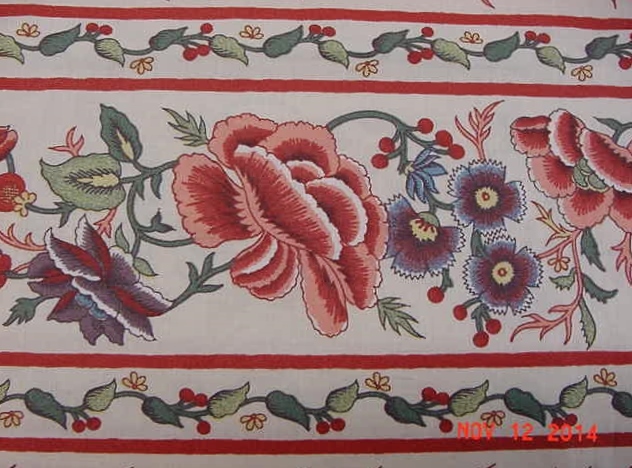 I continued on searching out the problems and found out that they began when I put the 2nd border on – which was NOT mitered, and of course made it really bad with the 3rd border! One would think that I would have listened to 3 friends who kept reminding me to not start any quilts that would require concentration while I was under stress. As I ripped all borders off and reached the “stars with cut off points” I decided that I needed to continue ripping and start this quilt over. Good thing I did as I quickly found out that my center block (Birds) was 1/4″ off. When I am in the process of working on a quilt and have “issues” (nice word for mistakes) I back into the problem and try to find out exactly what I did to get to the point where I am now. Well, one major mistake was this. I pre-wash all my fabrics and immediately iron them. Guess what! I forgot that I had set them aside and did not press. I guess I thought that I would “press as I go”, but even forgot that. So my mistakes really started before I started cutting. LESSON LEARNED! Then if was off to the computer hoping to find some more fabric just in case and Whittles saved me. The background fabric was more difficult to find. Although I have plenty, I love the fabric and found it at The Hen House (www.thehenhousemi.com). So that was pure dumb luck. This quilt will now become a Show quilt for next year. I will correct all mistakes and make sure that it is of Show quality, even if it never receives a Ribbon, it is a quilt that will be worth all the work. MORAL OF THE STORY – Do not expect anything to go right when under stress! Won’t Happen! So here I am on 30 May 2015 “starting over” with Enduring Love #270. 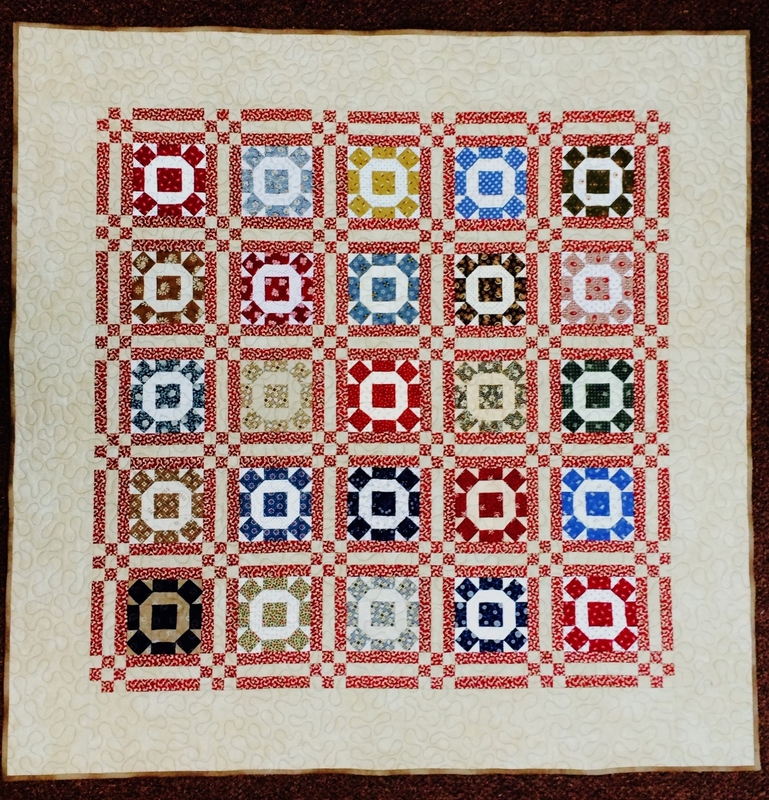 I have the Center Medallion corrected, 4 of the 12 Center Stars have been re-made, and the Square in a Square Border has been checked and appears to be “OK” (fingers crossed) as I do not want to have to re-make them. All fabric has been received, washed and YES, I just finished ironing the first set of fabrics and will iron the additional ones tomorrow. Quilting is sooooo much fun! I tried to salvage all of the 12 Stars that circle the birds, but quickly found that I was sloppy (probably not concentrating) and did not square the star points or the center of the star as I made them. Therefore in the end – a total remake of all 12 stars! They are all cut out and ready to be sewn together. Let’s hope I am more careful when putting them together and not forgetting to square each section! 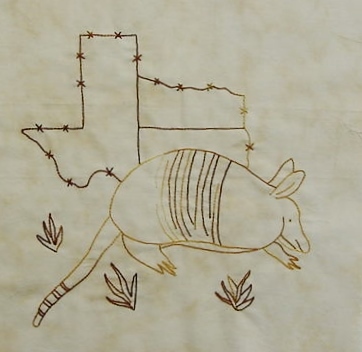 Have a great week-end and updates coming down the pike on my Texas Quilt! Here in La Vernia, Texas we have been blessed with 8 inches of rain in the last 2 or 3 weeks. I really do believe now the drought is in the beginning stages of going away! – Hopefully. This has been a 10 year drought and the last one was in 1950. Back then we only had swamp coolers – We were young and dumb and did not need the air conditioner’s like we have now. I have missed my Blogging and Quilting, BUT, good news. Hubby came out of that surgery great. I had to get him away from the Hospital so they would not make him sicker (LOL). We were home by 7:15AM on Easter Sunday. It is hard to believe that this Friday it will be 3 weeks since his surgery. Thursday we will go see the Surgeon and hopefully they will put him in a soft cervical cast. He has really done well. I would love to have some of his stem cells and grab that wonderful immune system he has. The scar is almost – almost gone. He now has a beautiful white beard and I am encouraging him to trim it when he can and keep it. Makes him look younger – and I feel older. LOL. I am thankful that I am able to meet all of his needs. Being a caretaker is a difficult job, no complaints here as he took care of me through 3 Lumbar back surgeries. What a trooper he was for me. Darryl is not doing well, but appears that he will make his 51st Birthday on Wednesday the 22 of April. It was on his 50th Birthday when he was told about the Cancer. He has beat the odds – they had given him 5% chance to survive a year. Although he is not doing very well now, and close to the end of his long difficult struggle with the Lung Cancer and COPD, he has made the year and beat the perdentages. I have been working on my Texas embroidery quilt blocks and last Friday I decided I could safely start on a project. I have 2 quilts ready to work on the settings, but it would be difficult for me at this time to really be able to concentrate on selection of the fabrics and the design setting. So those are in the “que”. I wanted to make this a “stress free” quilt project – (I have had the course with Stress in the last year) and did not feel that I would do a quilt justice pulling trying to pull fabrics and come away with something I would like in 6 months (Mood Changes?). I found a pattern I had purchased last year called Civil War Legacies (Quilts for Reproduction Fabrics) – Enduring Love #270 by Carol Hopkins Designs…… Now this is an interesting title……….How is it I did not realize that these patterns are made especially for certain reproduction fabric lines when I purchased it – Probably because I liked the pattern and did not pay attention, as I often do. So as I began to review the directions, the fabrics that the quilt had been made from were Judi Rothermel’s Enduring Legacy. 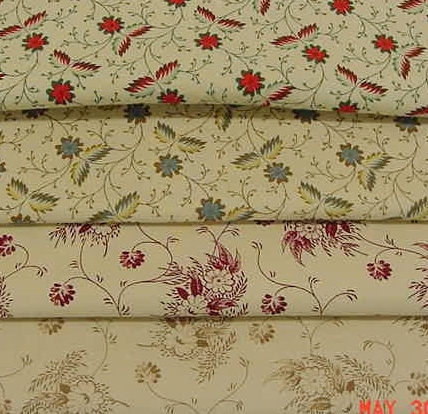 Of course, as always, I did not have on piece of that fabric line in my newly acquired mountains of reproduction fat quarters or yardage! I quickly googled the fabric line and found that Whittle’s in Kentucky had the majority of the fabrics I needed I was unable to find the border print so I chose another print and I found the 3 blue’s from Thistle Bee Quilt Shoppe in North Carolina. So all I needed was the fabric and I would be ready to start. I was so happy and surprised on Monday to find my stash from Whittle’s! Now I am inspired to get back to my passion of quilting and working on a quilt – not just “playing” around. I have started on the center medallion which will be a 12″ finished center. I have the stems in place and one bird (no wings yet) and the rest pinned in place. I am going to finish it today and tomorrow will start cutting out fabrics for the “borders”. I used fabrics from “Party of Twelve” for the Blue Bird and the Brown Bird Bodies. I wanted to add some lights so decided to use some shirting fabric! This will be fun. Here is the Medallion finished and ready for borders. Have a great week-end and enjoy quilting.